What would happen if, instead of bolting your doors against the intrusion of demons you invited them in? Bad Dog! is a vivid testament to the unforeseen love, beauty, and redemption discovered in the most difficult times and places. It reads like a collection of closely linked short stories (think JD Salinger) but is in fact a work of literary nonfiction (think Robert Fulgham, or Augusten Burroughs). Bad Dog! will appeal to anyone who has fallen into dark places and wants to climb back into the light. With quietly crafted poetic language of a quality rarely seen in spiritual books, Lin Jensen tells the stories of his remarkably difficult life: his tumultuous early years on a struggling Midwestern turkey farm, his failed marriage, and the search for meaning that led him eventually to become a Zen teacher. The raw and earthy lessons of Bad Dog! cut to the quick with an understated power, and the reader is left at the end of each chapter subtly transformed, able to reflect more deeply and more fruitfully on the struggles of our own lives. Lin Jensen's writing has rare poetic and literary merit. Lin Jensen received the Best Nonfiction/Spiritual Book award from Today's Librarian for his previous book, Uncovering the Wisdom of the Heartmind. He has taught writing in various colleges and universities for over twenty years, and continues to teach Buddhist ethics and practices at Chico State University. He is the founding teacher and senior teacher emeritus of the Chico Zen Sangha, in Chico, California, where he lives with his wife. "Bad Dog! is simply the best book on the wisdom of living I have seen in many years. Its honesty, insight, and pathos pull you into it the way good literature does. Indeed, it is very well written, which is unusual for the genre. I always say, take great care choosing the books to read, and I strongly recommend this one." "Jensen is a storyteller and a poet. As a memoirist, he is in the best of company: Thoreau, and Garrison Keillor with his tales of Lake Wobegon. Bad Dog! is an amazing, sincere account." "Lin Jensen writes with a deep understanding of life, the land, and the human spirit. This memoir reads like something Steinbeck might have written had he been a Buddhist, and I can pay an author no higher compliment." "The tact and restraint in Jensen's writing match the keenness of observation and the rare beauty of expression, allowing the words to go deep." "An exquisite work of alarming lucidity." "Lin Jensen demonstrates, by sharing his own clarity, that seeing the world as it actually is means being fully alive." "A heartbreaking and beautiful story of how a man's practice of compassionate attention led him to happiness after an abusive childhood and the pain that comes just from living in this unforgiving world. 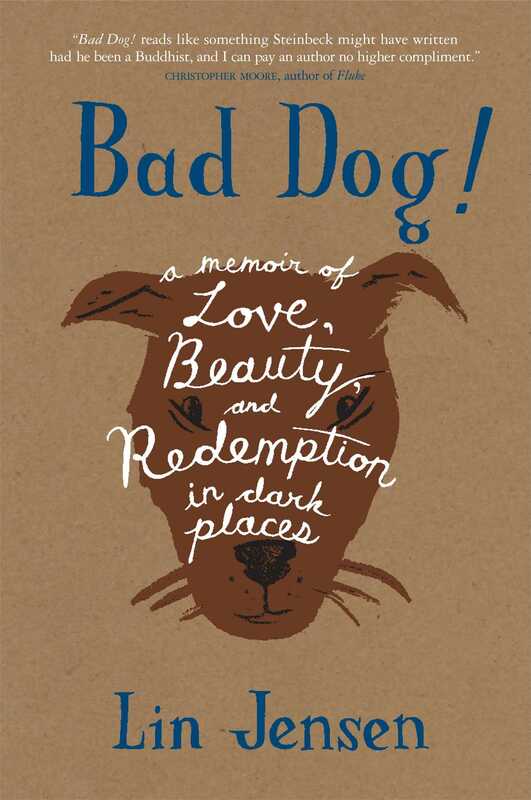 In Bad Dog!--which I wish everyone would read--Lin Jensen showed that kindness, forgiveness and acceptance are necessary practices for anyone who wishes to be happy. They don't make life easy--but they make life possible." "Compellingly beautiful... a reading experience that is both gut-wrenching and inspiring." "Beautifully and powerfully written, Bad Dog! is a hauntingly honest reminder to open our hearts to the whole truth and thereby fully appreciate the great matter of life and death." "In spare yet vivid language, Lin Jensen shows us scenes from a life that I never could have imagined. The true stories found in this can't-put-it-down exploration of family love and pain often made me cry--the kind of crying it feels good to do. I can't get these compelling stories out of my mind." Book Cover Image (jpg): Bad Dog!